Thinking of coastal food your mind conjures up fish in your mind? 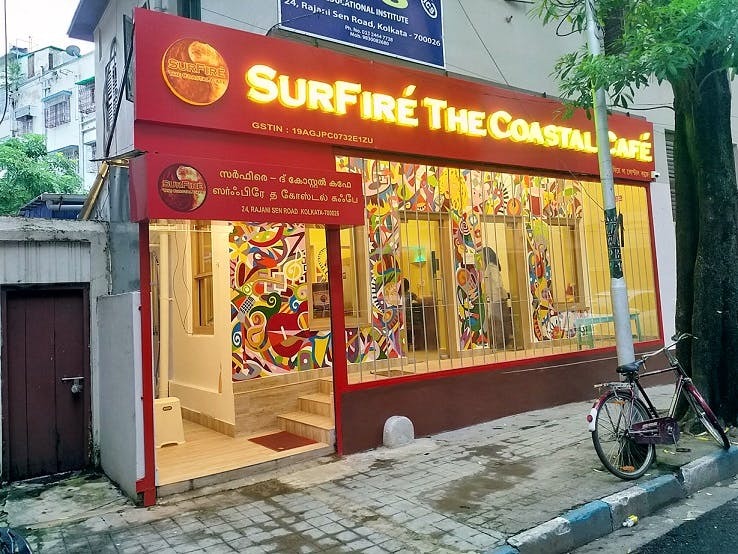 Kolkata has a new eatery that promises to turn this notion on its head and broaden your palate with some interesting coastal cuisine from down south and south-west. Still think dosas, idlis and sambar make up the gamut of South Indian cuisne? Give this idea and your palate a good shake as Kolkata's new eatery Surfire takes you on a tasty ride to coastal south and south-west India. Head to this kitschy-looking place in Kalighat and get treated to a range of coastal food from Kerala, Tamil Nadu and Goa. Try the deliciously tender Thattukada Mutton (aka roadside mutton) with their paratha or go veg and binge on the crispy Karuva Pillai baby corn as a starter. Tamil Nadu's special ghee roast chicken will leave you craving for more. The spicy Goan pork vindaloo and the butter-garlic crab is best complemented by their plain appam, but you can also request for an egg appam if you want something more substantial. If you're looking for something light, try their Goan chorizo dosa (this spicy tangy sausage really had us hooked!) or the deep-fried masala idli that will definitely tingle your taste buds. The usual servings of curd, lemon and sambhar rice is also on the menu. Sign off the coastal sojourn with their Kaapi Fizz (filter coffee served with cola) or the liquid dessert of Jigar Thanda (thickened milk served with ice-cream and other secret ingredients). While we scarfed on the delicious food here, we did find ourselves wishing there was more variety to gorge on. Pescaterians, don't forget to ask for the 'catch of the day' to try the day's best coastal dish. Oh, and chilly pork will soon be on the menu too.